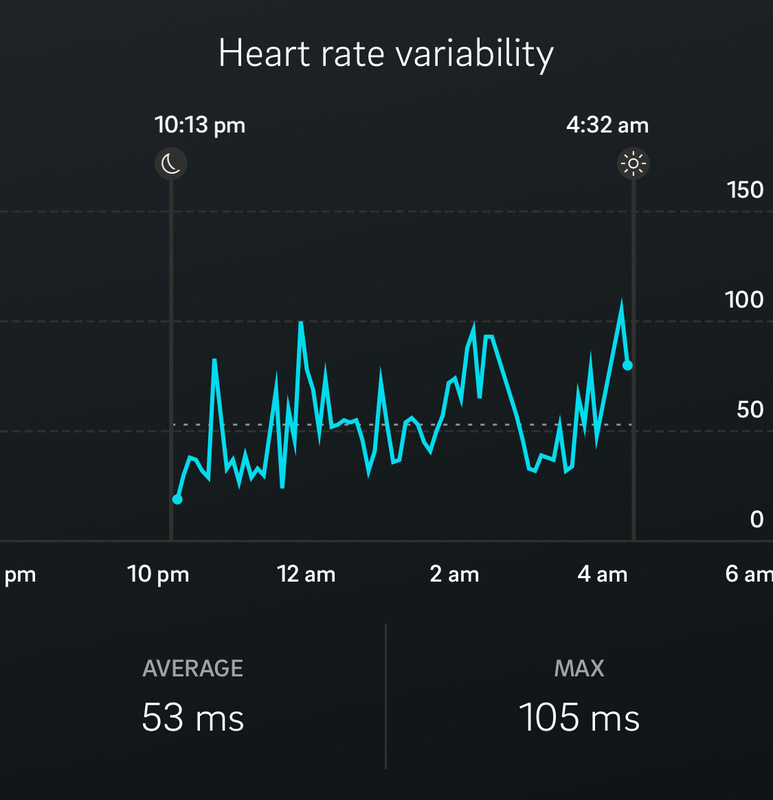 Ok so let’s start with what is Heart Rate Variability. 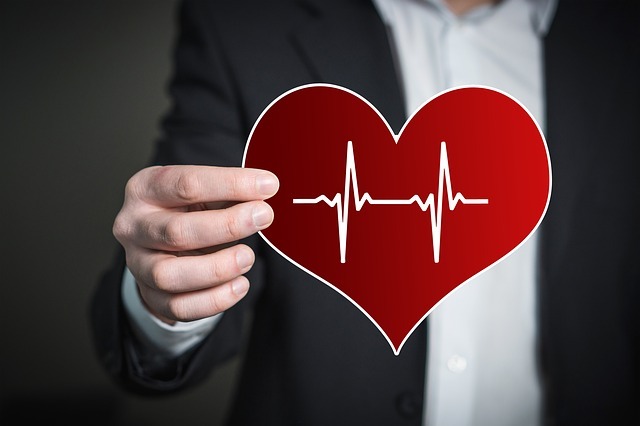 The fundamental aspect of Heart Rate Variability is the timing differences between heartbeats. A person under stress (such as after training) will vary the timing between beats less than a fully recovered individual. When you are fully recovered your heart rate variability will fluctuate more between beats as the heart does not have to work hard. Now keep in mind the variability is in the milliseconds but these small timing variances can tell you a lot about your readiness. The best time I have found to monitor heart rate variability is during sleep. During sleep, your activities will be minimal and will limit external factors of daily life from impacting your view into your heart rate variability. 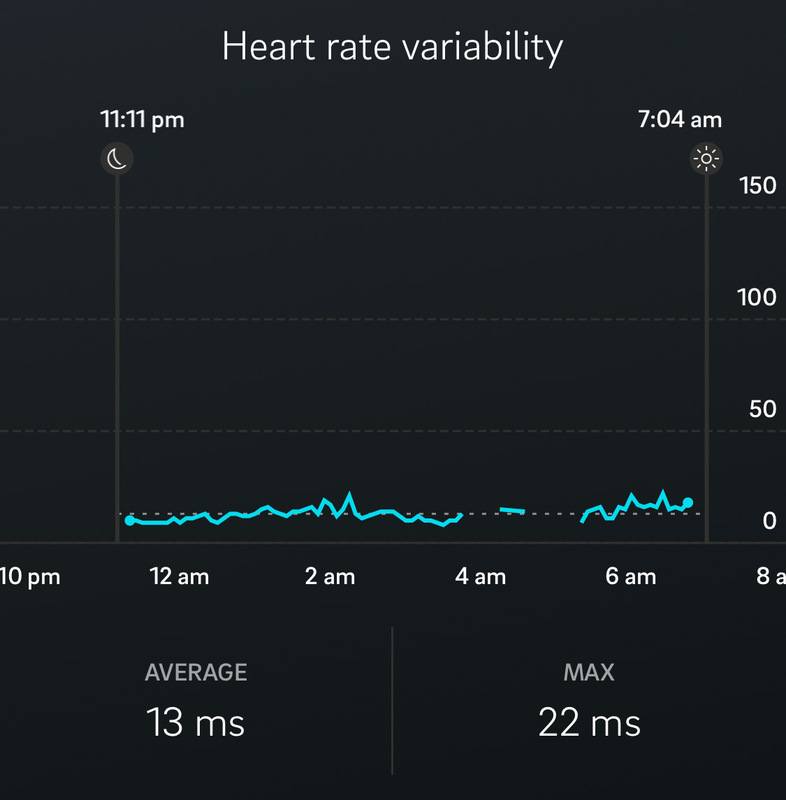 As you can see in the three charts above my heart rate variability across three different nights sleep is varied and were impacted by different training day intensity levels. In the first chart I had worked out for 3 hours switching from multiple challenging rides on the Peloton Bike, a boot camp class on the Peloton Tread, and a Peloton Yoga class to stretch out the muscles. What you can see in the chart is that my heart rate variability was very low and remained consistent through the entire sleep cycle, and most likely through a portion of my day. In this case, it is really critical that I focus on a low impact/intensity workout or completely rest as my body is still in repair mode. 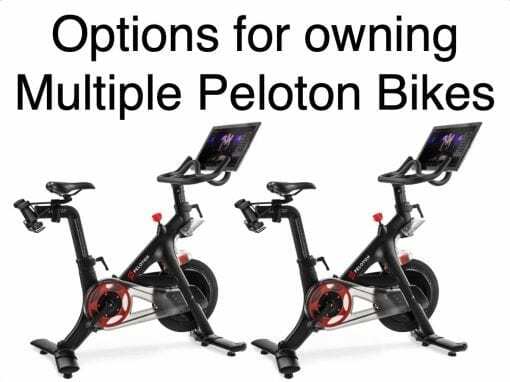 In the second chart I had worked out for about an hour and a half for a 45 minute Tabata class on the Peloton Bike and a 45-minute running class on the Peloton Tread. When you look at the chart you can see that I started to recover around 3am and my body was starting to be closer to recovery, but given my normal ranges, I was still not yet recovered. In this case, I know to keep my routine at a moderate level, this is not a day to go all out. In the third chart I had worked out on a single 45 minute Heart Rate Zone Endurance ride on the Peloton Bike. 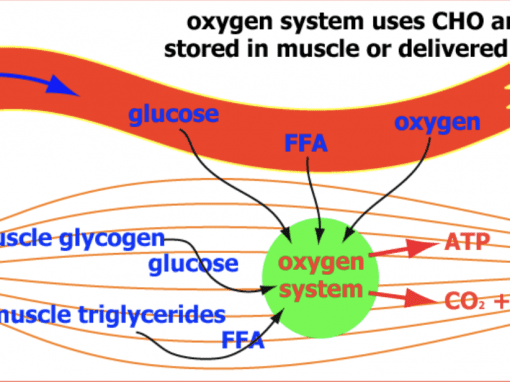 This training effort was very low intensity and focused on maintaining a low heart rate zone two as I needed to recover from a previous day’s intense workouts. In this case, my night time heart rate variability varied showing I am in a well-rested state. Today is the day that I should really crush my workout and really push my body with very high intensity. Since September I have been tracking my Heart Rate Variability on a nightly basis. During the last three months of 2018, I started focusing on increasing my workout loads as represented in the Average Activity Score segment of the chart below. 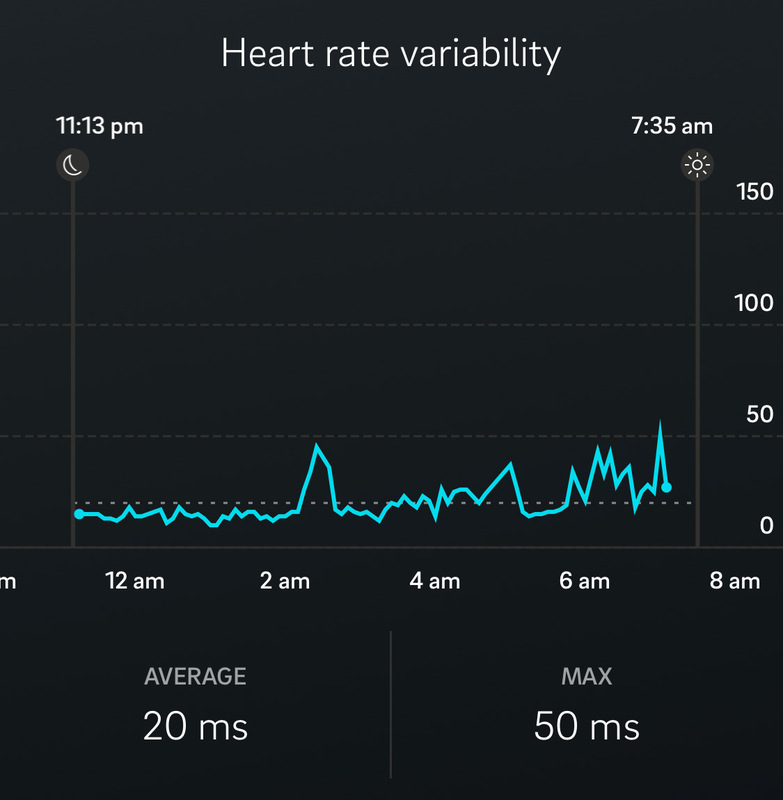 As you can see the increase in work impacted my Average Heart Rate Variability almost in line with the increased work. The key takeaway for me is to make sure I am fully recovered before attempting a very taxing workout. This is one of the critical factors that has helped me hit new Personal Records and continue to grow stronger over time. When I see I am not fully recovered it is essential I listen to my body and exercise at the right levels based on my readiness. As I focus on my fitness goals for 2019, I will continue to plan out my workouts to keep me accountable, but I am going to continue to incorporate my Heart Rate Variability data each day to determine just how hard I am going to push..